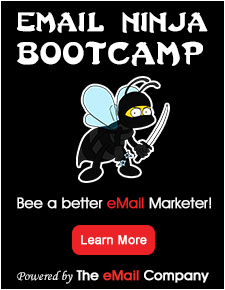 Email is a unique marketing channel because it is permission based. That’s one reason email has a high return on investment: If consumers raise their hands and say, “Please market to me;” they are likely to purchase in the future. But building a large opt-in subscriber base takes dedication, strategy and time. Here are seven tips to help with that process. Your email sign-up box should be easy to find and obvious on your home page. Additionally, allow visitors to sign up from other pages, especially on the most popular pages of your site. Many top retailers are moving their subscription boxes to the bottom of the page. But I disagree with this. If gaining subscribers is a top priority, the sign-up box should be above the fold, and perhaps in more than one location on the page. When designing your email sign-up form, ask only for information you absolutely need. Because consumers are impatient and will abandon a lengthy form, keeping your email sign-up form as short a possible — while also gathering all the necessary information — can be difficult. A strategy that works well is to design a two-step process. When consumers enter their email addresses, they are subscribed. They then proceed to the second step and — if they choose — fill out additional form fields. Crutchfield does a good job with its sign-up process. After entering an email address, a new window pops up (a) asking for additional information, (b) describing the benefits to subscribing, and (c) inquiring if you’d also like to receive the company’s catalog. 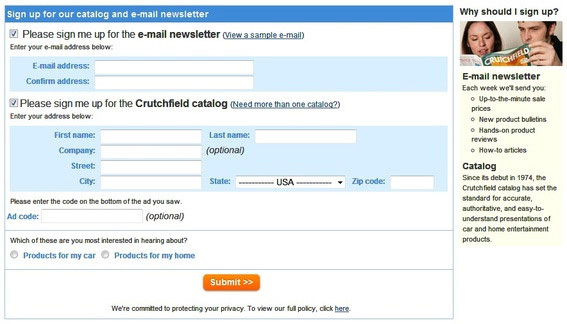 Screenshot of Crutchfield’s email sign-up form. Give your subscribers a reason to sign up. Communicate to them that they will receive exclusive offers or valuable information. Treating your visitors as VIPs is a smart strategy and gives them a reason to not only subscribe, but also to remain a subscriber for the long term. Make sure to explain how often subscribers can expect emails and what types of communications they will get. Content sites that provide third party advertising should inform subscribers ahead of time to reduce high opt-out rates. Monitoring your opt-out rate may give you an indication of how you are delivering on your promises. Having periodic contests is a great way to increase your subscriber list. Remember that customers who sign up for contests may not be as responsive as “normal” subscribers, and contest subscribers may warrant a different email strategy all together. Yes, pop-ups may be obtrusive. However, site visitors sometimes need a bit of nudging to take action, especially something as easy as signing up for a newsletter. It is something worth testing for many sites. The size, location and triggering action of the pop-up can all be altered to find the best combination that will yield results. A welcome email is like a face-to-face interview with your prospective new customer. Welcome emails get high open rates, so make the most of the opportunity by presenting attractive offers. There is a lot your new prospect may not know about your site. Welcome emails should be sent in real time shortly after the customer signs up to your site. 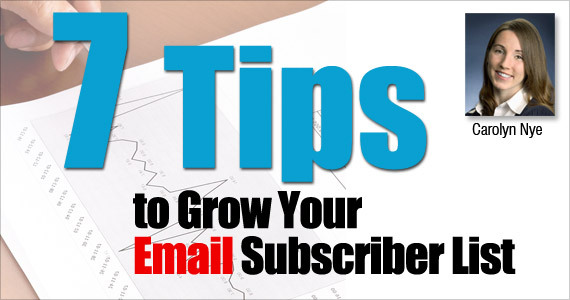 Your subscribers are the backbone of your email program. Don’t lose sight of optimizing your basic subscription process as well as employing tactics to easily increase your file. Don’t be afraid to get creative and try something new. Profile: Carolyn is Email Marketing Manager for USAData, providing businesses with consulting, data and technology solutions. Previously she was Marketing Manager for S&S Worldwide a direct marketer of arts & crafts and educational supplies for over five years. She is responsible for the planning and implementation of email marketing programs and has developed a wide variety of highly successful triggered and transactional email campaigns designed to engage customers, drive sales, improve service and overall customer satisfaction. In addition to email marketing, She is an occasional speaker and contributor at industry conferences, featured in trade articles and webinars. Carolyn holds a BS in Marketing from Umass Dartmouth and currently pursuing an MBA in E Commerce and Global Marketing from the University of New Haven. One that I would add is to provide an incentive for people to subscribe. This post couldn’t be timelier. Thanks for the great ideas, a true recap of yesterdays show.